The incredible explosion of music at the beginning of the 20th century was confronted, during the Great War, with other explosions: military, social and political. 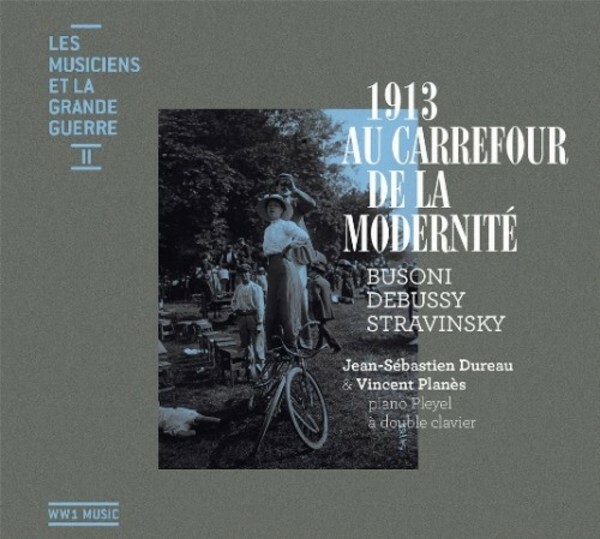 The scandalous arrival of the Sacre du printemps in 1913 gave way to creations which were more interiorized, part of history, tradition: Debussy�s En Blanc et Noir, premiered in Paris on 22 January 1916 in the �h�tel de Polignac� in a concert dedicated to �affectionate help to musicians�; Busoni�s Fantasia contrappuntistica presented a modernity in 1910 which was not cut off from its heritage but, on the contrary, fed from it, the better to transform it. Jean-S�bastien Dureau first studied music in Lyon, then with Jean-Fran�ois Heisser, Christian Ivaldi and Alain Plan�s at the Paris Conservatoire National Sup�rieur de Musique. He graduated in 1996 with first prizes in piano and chamber music and pursued advanced studies with G�ry Moutier at the Lyon Conservatory. In 1998, he went to study in the USA with renowned Hungarian pianist and teacher Gy�rgy Seb�k at the Indiana University School of Music in Bloomington. Over a two year period he had the opportunity to work with outstanding artists such as J�nos Starker, Reiko Neriki, Franco Gulli and Leonard Hokanson. He was awarded the Artist Diploma. Born in Annecy, he came to pursue his musical studies in the USA upon his graduation from the Lyon Conservatoire National Sup�rieur de Musique. At Indiana University, he had the privilege of studying with Menahem Pressler and to serve as J�nos Starker�s class pianist. He then undertook doctoral studies in collaborative piano at New England Conservatory with pianist Irma Vallecillo. While in America, he collaborated with many prominent artists among which violist Kim Kashkashian and violinist Itzhak Perlman were major influences on his musical development. From 2007 to 2013 he taught at the Maurice Ravel Conservatory.